1. Solar Energy reaches the earth by electromagnetic waves. 2. The length of these waves ranges between 290-5000 millie rows. 3. The solar spectrum is divisible into visible and invisible spectra. 4. The wavelength between 400-750 million is called light, while those which are below 400 mc are called ultraviolet rays and those above 750 are called infrared rays. 1. It has a great ecological importance. 2. Light is responsible for synthesis of food by green pigment. 3. Out of the total solar energy reaching the earth only 2% is used in photosynthesis and about 10% is used in other physiological activities. 4. Green plants during the process of photosynthesis manufacture carrotty dates from water and carbon dioxide in presence of light. 5. There is no direct effect of light on the respiratory activity in the pant body. 6. An indirect effect is much important as in shade and underwater the light becomes a limiting factor and photosynthesis is not sufficient for effective growth. 7. Stomata of the leaf open in the day and close in the night. 8. 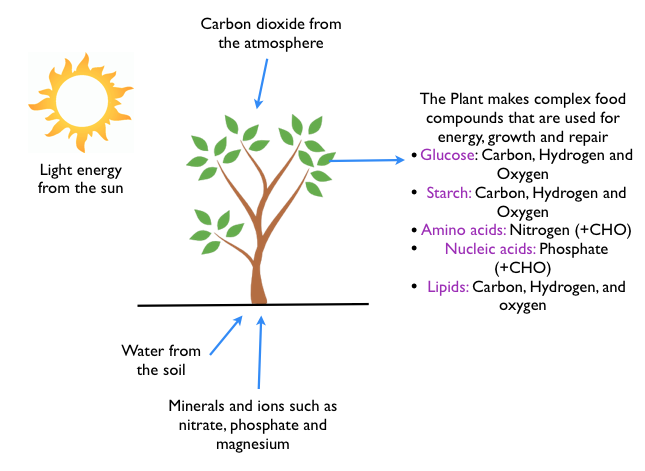 Requirements of different light periods by plants are known as photoperiod. To which plants are exposed is called photoperiod and the phenomena of photoperiodism has pronounced effect on the vegetative growth as well as flowering of the plants. The plants which require daylight for less than 12 hours for their normal growth. e.g. Tobacco, Dahlia, Cosmos. These plants require 12 hours night for their normal growth of tomato. The plants which require daylight for more than 12 hours for their normal growth, e.g. radish, spinach, potato. 10. Plants may be classified ecologically according to their relative requirements of sunlight or shade. Plants grow best in full light. Plants can grow fairly well under shade. Plants which can grow best at lower light intensities but can also grow well in full sunlight. 11. Light affects the movement n some plans. The stem, roots, and leaves show a different response to light. 12. The effect of sunlight on the plant movement is called heliotropic effect. The stem elongate to wars the source of light (Positively-Phototropic) and the roots are negatively phototropic. 13. The leaves grow transversely to the path of light. 14. Light shows manifold effects on the growth of the plant. 15. The plant growth is slow in low light intensity. 16. Red light favors the growth. 17. Light of shorter wavelength except violet are injurious to plant growth. 18. The seeds when moist are very sensitive to light. 19. In some cases, the germination of the seed is retorted in the light. 20. Mostly the stomata remain opened in the light and closed in the dark. 21. The growth of plants depends especially on the intensity, quality, duration, and direction of light. 22. The plant growth is slow in the light of high intensity. 23. Red light favors the growth. 24. In the absence of light, the growth is very poor and plants show estimation. The stem becomes tender narrow, long and the leaves become pale green, soft and small. This light is essential for the normal and healthy growth of plants. 25. Greenlight is completely reflected by green parts of the plants making them look green. 26. The rate of photosynthesis is greater in intermittent light than in the continuous light. 27. The quantity of light or intensity is greatly modified by the latitude, altitude, conditions of the atmosphere, layers of vegetation and topography. 28. In the forest, only the mature trees of the tallest species ever receive full insulation. Herbs grow is still weaker light. 29. The ground vegetation itself is the best practical indicator of the light e.g. Pinus roxburguii is light demander. Grass oplismenus and Chloris dolly thrive only under shade. Thus light duration influences formation of flowers, fruits, seed, growth in many plants and accordingly exerts striking distributional effects. 30. Moon light plays some important role in plant life. It sometimes satisfies light requirements of certain seeds, promote starch hydrolysis in the leaves, affects nocturnal leaf movement in legumes and stimulates the sexuality in certain marine algae.